I am almost done with the first slipper! I only have a few more rows to complete and then I will start on the second slipper. 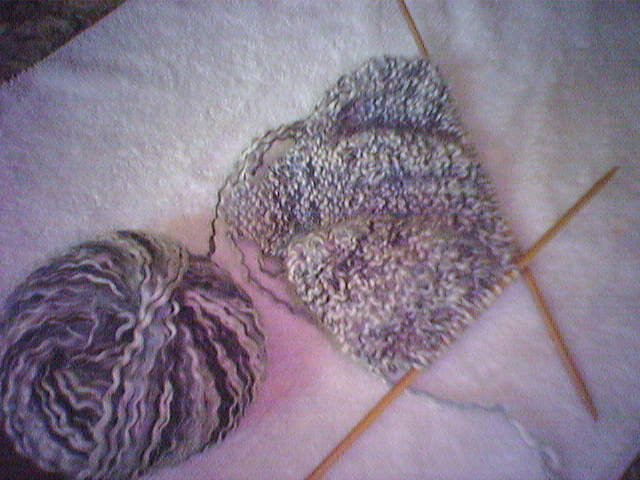 The yarn is made in Germany and is a white and gray mix. It is scrap yarn that I had left over from a knit skirt I made earlier in the year. I am ready to get some new yarn. I hope my mommy loves her new slippers!! Michael is leaving soon to go back to school. He is moving to Wyoming, where the weather gets pretty chilly. I think I am going to make him a snow hat or scarf or something. Maybe a cozy blanket. We'll see. I am also going to make him a Calendar of really cute photos of me for each month! I was doing some research while taking a break from my latest knitting adventure. The article says to join Blog Carnivals to generate more traffic! I am going to look into it, I want more traffic! I just joined a Blog Carnival, called B | Jealous. So I finished knitting my best friend Tara's wedding garter and gave it to her on Saturday night at her Bachelorette Party. I am going to knit some comfy slippers for my mom for her birthday, which is August 28th. The 29th is my parents 26th wedding anniversary. So I am going to get them some new dinnerware for the kitchen.